It's Just Mobolaji | Music & Entertainment: They Can Dance! 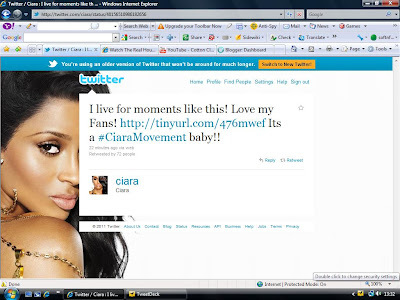 Minutes ago, Ciara tweeted a video.. when I saw it was dancing, I just had to watch and when I did. I did not regret, now I see why Ciara was so happy about it. Whilst everything is going downhill for her right about now, the girl deserves to smile. When I mean that this dance group went all out.. THEY WENT ALL OUT!! Check out the video below. The songs that they danced to are (in order): Promise, Like A Boy, Ride It ft. Ludacris, Gimmie Dat.